If you ever wanted to know, how carNAVi products are made, take a look at this facebook album. It’s an exclusive view behind the scenes – inside the production of the all new carNAVi S 500. See the main steps the devices undergo until they are what they should be – the Philippines most sophisticated GPS car navigation devices. Some good news for those individuals with the fact that carNAVi is updating their Reuse and Recycling program, which allows carNAVi product owners to exchange the item in return for a gift voucher that can be used to purchase carNAVi goods at the carNAVi Store online. The program covers carNAVi navigation devices but not accessories. carNAVi devices are designed and build to be a reliable tool for your all day life. Unlike most other companies – we are not only concentrating on selling our products, we provide one of the broadest and most comprehensive local service on GPS navigation devices and accessories in the Philippines. At carNAVi , we place a very high emphasis on a reliable design of our devices on which our clients rely. We are offering a new webinterface allowing smartphone users a convenient way of browsing the information on our website. Just open car-navi.ph with any internet enabled smartphone and our system will automatically generate a customized design for your device. Supported are all iOS devices with small screens, like the iPhone or the the iPod touch, all Android systems and Blackberry phones. The carNAVi PRO TV, ultra slim, portable and fully featured with the latest power saving SiRF DUAL CORE GPS/Galileo processor, large 5-inch TFT touch screen and wireless bluetooth handsfree. The first navigation system in the market, that not only can play MP3 and video files, carNAVi PRO TV has an integrated analog TV, so you can watch your famous series or news while on the go. 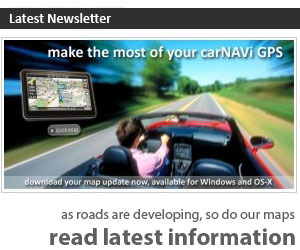 NAVITEL – is a leading navigation solution provider for automotive navigation industries, specialized in development and production of satellite navigation software and cartography. Navitel Navigator is truly multi-platform turn-by-turn navigation with outsanding 3D graphics and real-time traffic service.